There are just five more days until the NRA Annual Meeting & Exhibits kicks off in Louisville, Kentucky. If you can make it to the big event, you should go. After SHOT Show, this is the biggest event of the year for firearms fans — thousands of products will be showcased by 750+ exhibitors in a 500,000 square-foot facility. You can meet celebrities, and have fun at an on-site airgun range. The Exhibit Hall opens at 9:00 am on May 20th (Friday Morning). The Meeting kicks off with the Nat’l NRA Foundation Banquet on Thursday evening, the 19th. This year’s NRA convention will feature a variety of special events. The ever-popular NRA Country Jam kicks off at 6:00 pm on Friday, May 20th at Louisville’s Belvedere at Waterfront Park. The official NRA Members Meeting will be held Saturday morning at 10:00 in Freedom Hall at the Exposition Center. NRA leaders Wayne LaPierre, Chris W. Cox, and Allan Cors with address the membership. Many other seminars will be hosted over the weekend. Purchase Event Tickets. Entry to the exhibit hall is free for NRA members and their immediate family. Members of nationally recognized youth organizations (Scouts, 4-H, etc.) in uniform or otherwise properly identified will also be admitted free as well. 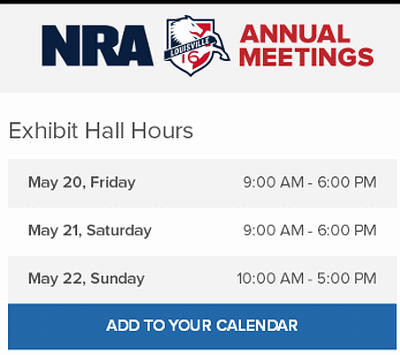 Non-members may register by joining NRA on-site. NOTE: Pre-registration has closed. 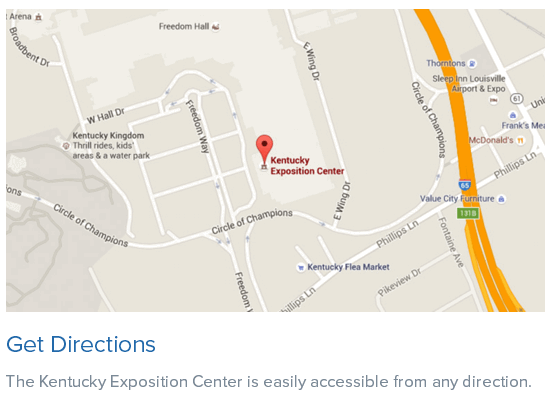 You may register on-site by visiting the registration counters located in the Kentucky Exposition Center Lobby. 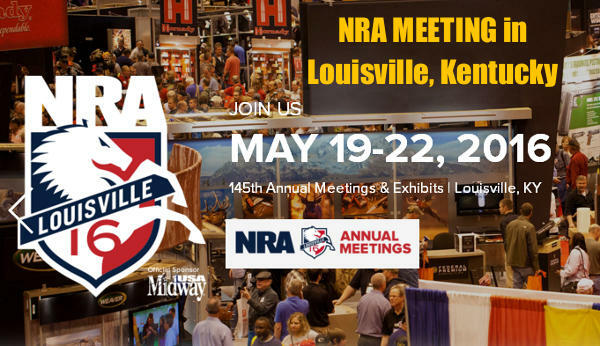 Share the post "NRA Annual Meetings & Exhibits Kick Off Soon in Louisville, KY"